For some time now I have had a big problem with swollen feet and legs causing much distress. My right shoulder was very painful which I didn’t connect with the swelling problem. I am trying a product which so far seems to help so I will post my results here. The product is called “Swell No More”. I bought it from Amazon , they also have a website with details of what is in it and how it works here. Day 2 – Wed Mar 15, 2017 – Took 2 pills early. Increased urination but better than with water pills. Shoulder a little more painful but still better than before I started. Late afternoon shoes felt like they were getting tight again so I took another pill. Head sore again when I went to bed. Woke up a couple of times to urinate during the night. Day 3 – Thurs Mar 16. 2017 – Took 2 pills early. Seem to empty bladder a little better. Feet feeling warmer. There are several herbs and vitamins in the product which are for edema and joint pain which is why I think it works for so many people because one of them should be what you need. Shoulder has a little pain but I can reach without pain. Swelling appears to be down some. Day 4 – Fri Mar 17, 2017 – Took 2 pills early and one more later. Feet don’t seem as swollen, feet feel warm. Shoulder does hurt at times but hasn’t been bad. One thing I’ve noticed is feet feel warm until I get in bed then they start feeling cold. Day 5 – Sat Mar 18, 2017 – 2 pills. Not much difference. Day 6 – Sun Mar 19, 2017 – 3 pills. Not much difference. Day 7 – Mon Mar 20, 2017 – 2 pills. Feet about the same but bladder is filling up fast, having trouble holding it. Very sore in both shoulders. Day 8 – Tues Mar 21, 2017 – 2 pills but took them later in the evening as I had to be someplace earlier. Pretty stiff all over. Day 9 – Wed Mar 22, 2017 – 2 pills in afternoon. Not as stiff but hands cramping. 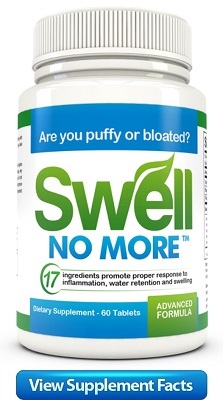 I had decided to give it two weeks just using swell no more, if swelling isn’t much improved by then I will start using water pills along with it. Day 13 – Sun Mar 26, 2017 – Swelling hasn’t seemed to change much so I decided to take a water pill too. Seemed to go even less, did they cancel each other? Day 14 – Mon Mar 27, 2017 – 2 pills in afternoon. Went a little more. Back is sore, left side just above where your belt would be. Day 15 – Tues Mar 28, 2017 – Last night urine output was more than usual, got up a couple of times. Through the day have went every hour or so, drinking plenty of water, back still hurts. Took 2 pills early afternoon. Thurs July 27,2017 – The Swell No More did not do what I had hoped. I used all three bottles I bought so I started trying different ones which I will be talking about. Will be updating this hopefully daily and I would be interested to hear what you have tried? Did it work or not?